Sift the flour into a medium bowl. Make a well in the center. In a small bowl, whisk together the milk, eggs, sugar, vegetable oil, and salt. Add to the flour and whip to a smooth batter. Refrigerate the batter for two hours. Heat a nine-inch crêpe pan on medium high heat. Brush with butter. Measure batter into the hot pan. Immediately tilt and rotate the pan so that the batter covers the bottom of the pan in a thin layer. Cook until bubbles appear and the bottom of the crêpe is a nice even, golden brown. 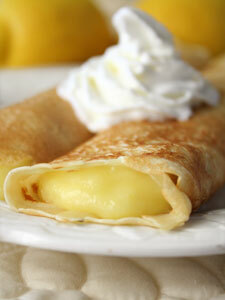 Use a pallet knife or thin, sturdy spatula to turn the crêpe. Cook the second side only it is a blonde color, not as dark as the first side. Remove the crêpe to a sheet of parchment paper or waxed paper and repeat with the rest of the batter. Fill your crêpes, folding as desired. Serve with whipped cream.